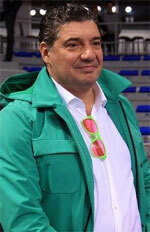 Raznatovic Misko is currently not part of the Hoops Agents / Eurobasket, so his players are not promoted on our website !!! Misko founded BeoBasket agency in 1995 and has almost 20 years of experience in representing basketball players all around the world. He is Attorney at Law and one of the most respected and influential basketball agents in the entire industry. Misko negotiated and completed some of the most important deals in Europe over the past decade. He was a professional basketball player for years. FIBA Certified Agent.